If you guys are long time Pulp Summer Slam followers here's good news that will make you excite this summer. Pulp Live World already announced the band line up for 2015 which themed as "Angels Descend". 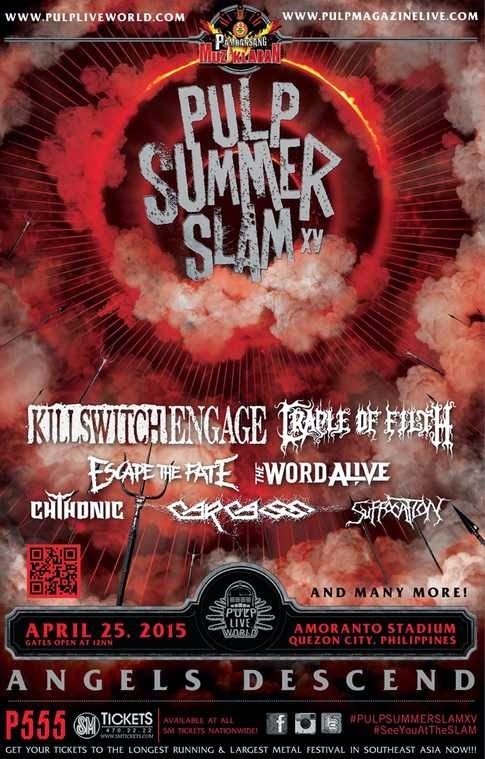 I’m sure you’re excited to know the foreign band line up for this year Summer Slam XV metal festival. Here are the lists of foreign band performing on this yearly event at Amoranto Stadium, Quezon City Manila Philippines. Last year’s local band line up was compose of our very own underground bands and we do hope to see them again for this year. Though Pulp has not announced yet who are the local bands performing along with foreign performers, we are expecting Red Horse bands and artist to perform on this event. General Admission cost you 555 pesos and of course we do expect freebies. The price is a bit higher that the previous year, hopefully there will be something good to expect for this years event at Pulp and Red Horse teamed up to make this event happen. For tickets, you can check at SM Tickets and for VIP or Pulp Royalty inquiries you can call 7274957. For performance schedule will update this post as soon as Pulp post their official time schedule of the performing bands. Don’t forget to visit pulpliveworld.com and check their social media account for updates on this event.